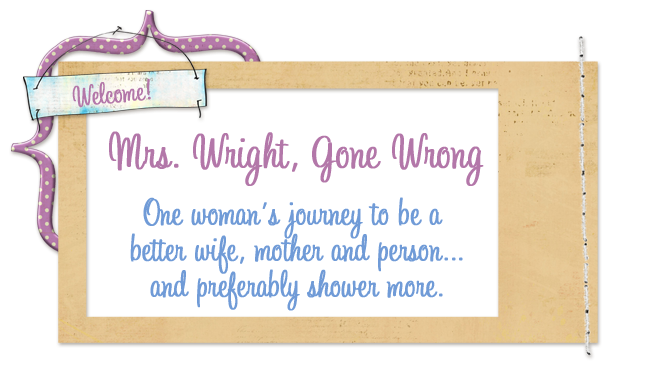 Mrs. Wright, Gone Wrong: Day 17- I'm fweakin out! Little Man recently brought to my attention the fact that I have a bit of a language issue. He was outside in shorts (in 40 degree weather) and told me that he wanted some pants because his legs were "freaking cold". Technically he said "fweakin cold" but you get the picture. Sure, he could have used some other words that I've let slip more times than I'd care to admit, but I'm still not crazy about my almost 4 year old saying "fweakin". Sweetie Pie is 5 and we recently had a talk about how 'crap' isn't a bad word, but not really one I want coming out of her mouth. It would probably sink in more if I didn't use it a million times a day, usually when I realize all the cleaning I still have to do. Maybe I could use this as my new excuse why I haven't broken the plastic on my Jillian Michael's DVD- I'm sure it isn't going to be pretty language-wise. Naptime is right around the corner (you may picture me jumping for joy now) and I have big plans to clean the kitchen, start prepping dinner, move the laundry along and start on the felt food for Caitlin's fundraiser. All I want to do is take a nap and pretend I'm not doing well on The Biggest Loser's temptation challenge. I also want to delve into my new book which I have shown extreme willpower with by not staying up until 5am reading it cover to cover. Since I share everything else it may be time to talk about my Tori Spelling obsession. I have never seen an episode of 90210 and don't really like Lifetime movies, but I LOVE watching Tori & Dean on Oxygen. I read her first book sTori Telling last summer and couldn't put it down. This time it's Mommywood, and I'm trying very hard to get my chores done before I crack it open. Laugh at me if you must, but I love Tori just as much as the gay guys. Senorita Snarkalicious (aka my sister who wanted a 'code' name) and I were at Target the very morning it came out so I could beat the crowds and get my copy. Of course I'm joking and didn't even see another person in the whole book section, but I know the other fans are out there. Maybe they were home showering like normal people...showoffs! I love your sister's code name, lol. My daughter tries to pull the whole "freakin" & "crap" talk, but now she just does it with a smirk on her face b/c she knows better. Oh I wish freakin and crap were the only things coming out of my mouth :-) Tori Spelling, huh? I might have to check that out - always looking for a good read! Yes my code name is fweakin awesome. Silly because I have so many nicknames my nicknames have nicknames. You fail to mention that I was also at Target to pick up an new release book. I had to have Hungry Girl's 200 for under 200 receipe book. I had to beat the crowds to buy a diet cookbook at 9 am in Wasilla fweakin Alaska. I don't think we encountered another customer until we rounded the bend into the 75% off Easter Candy. I didn't buy any because you know I had the diet cookbook, you wouldn't want the checkout person to judge you until after the packets of cheese from yesterday's lunch fell out of your purse. (Heretofor known as "purse cheese") But please feel free to ask Miss Shredded and Jammed how much Easter candy she purchased, then ask how much was consumed during the Biggest Loser. Also are you counting the minutes that you are fast forwarding through in your calorie count? Because that is a lot of math and I am going to need a point conversion scale for the remaning minutes minus the commercials and any of the moments where the contestants are talking about who they are going to vote off, I hate game play and suspense, so get cracking. Please feel free to use the weight watchers slider in my purse, it's right next to the cheese and wilted lettuce. Amber, she is pretty fweakin young, but not that young. Our friends watched 90210, it was not allowed in our house. I don't like Tori Spelling, but only because I do whatever Chelsea Handler tells me to do. OOOhhh! I'm having the language issue with ...um....er....Daisy! Ya, Daisy. Anyhow...Daisy has a mouth like a sailor. It's my fault because I thought I was so smart and I told her she could swear as long as it wasn't at school. I did this thinking it would take the fun or mystery out of bad language. Anyhow, I rescinded that permission with the promise that I too would watch my mouth. So far its only working when Rose reminds me of the deal.